We spent the weekend cleaning out the garage and setting up the carpet and screens. Honestly, Brett did 95% of the work because, at this point, any sort of physical activity by me seems to trigger a relapse of intense pain. We spent a day last week back at the OB triage center, attempting to adjust my pain medication so that I can hold out another 8-9 weeks. On the bright side, Rory is doing spectacularly well and is up to 3 pounds already. As he continues to grow he’s begun to push on the ovarian cyst more and more causing the increased pain. With the unseasonably warm weather, Cardin was more than excited to put together the garage and play in her sandbox. She has no fear of the sand now and easily jumps right in, quite a change from when we first introduced her to it and she refused to put her hand in the box, let alone her body. Last night, as we played in the garage, we heard a strange noise that seemed to be emanating from inside the toy box where we keep all the balls. It sounded similar to a firecracker going off; with the continuous popping noise. Cardin immediately wanted to investigate, but I felt that Brett should take one for the team. Listen Lady, it’s all fun and games until someone loses an eye! Luckily, there was no eye loss. 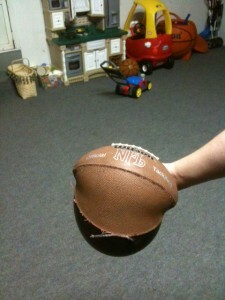 Instead we found the remains of an old football that had split at the seams. The popping noise we heard was the seam slowly ripping away. The inside belly of the football had just recently been pumped and the expansion of air must have been far too much for the meager seams to handle. Looks like we won’t be teaching Cardin how to play football anytime soon, but she did learn about physics. I’m pretty sure I’m going to try to extract the belly and make a hat out of the skin of the football.